The first question to ask oneself before watching this show is, “Do I like Keeping Up with the Kardashians?” If the answer is yes, this show is definitely for you. 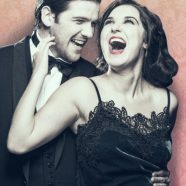 Noel Coward’s Hay Fever is basically a highly entertaining stage equivalent of the reality show, and provides a glimpse into the lives of the Bliss family, arguably the fictional ‘It’ family of 1920s Britain. Over the course of a weekend, when each family member has invited a guest to the mansion, retired actress Judith (Susan Wooldridge) creates outrageous drama and is joined in by her children Sorel (Rosemary Boyle) and Simon (Charlie Archer). So deeply steeped in mischievous mind games, guests are inextricably sucked into the action and forced into engagements without knowing how much of it is real or plain fun. Hay Fever, directed by Dominic Hill, is a visually intriguing spectacle. With the ornate furnishings of the salon and decadent evening garments designed by Tom Piper, one is definitely brought back to the roaring twenties when everyone has too much money and nothing to do, except to spread out on a couch and laugh artificially about musings on love, or to learn the names of flowers in the garden. Special mention goes to Myra McFadyen, whose unexpected song during a quick scene change was charming in all its simplicity. Audiences will leave the theatre in high spirits after such a strong, engaging performance by the cast.